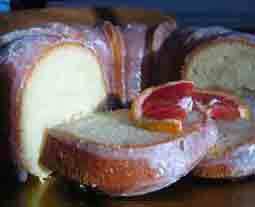 Blood Orange Bundt Cake - A recipe from Savor California, the online showcase for extraordinary gourmet foods and beverages from California. Preheat oven to 350F. Coat a 12-cup Bundt pan with cooking spray; dust with 2 Tablespoons all-purpose flour. Set aside. Combine granulated sugar, milk, oil, 3 tablespoons juice, and eggs in a large bowl, stirring with a whisk. Lightly spoon 2¼ cups flour into dry measuring cup; level with a knife. Combine flour, baking powder, salt, and baking soda; stir well with a whisk. Add flour mixture to oil mixture; stirring with a whisk until smooth. Pour batter into prepared pan. Bake at 350F for 55 minutes or until golden brown and cake begins to pull away from sides of pan. Cool cake completely on wire rack. Loosen edges of cake with a narrow spatula. Place a plate upside down on top of the cake; invert onto plate. Combine powdered sugar, remaining 1 tablespoon juice and butter, stirring will with a whisk. Drizzle glaze over cooled cake.